Funny title? Let me explain, when Paper Crafts magazine closed its doors hundreds of cards that had been picked up for publication were sent back to their owners, never getting their chance to shine in whatever magazine issue they made it in. This was one of those cards! In-fact Lorena Canto and I submitted to the designer call asking for a team of two to submit a card they both designed from the same inspiration. I was so excited to share a page with my dear friend but alas, the card was sent back to me. So, I re-took another picture, and today I am sharing it with you! 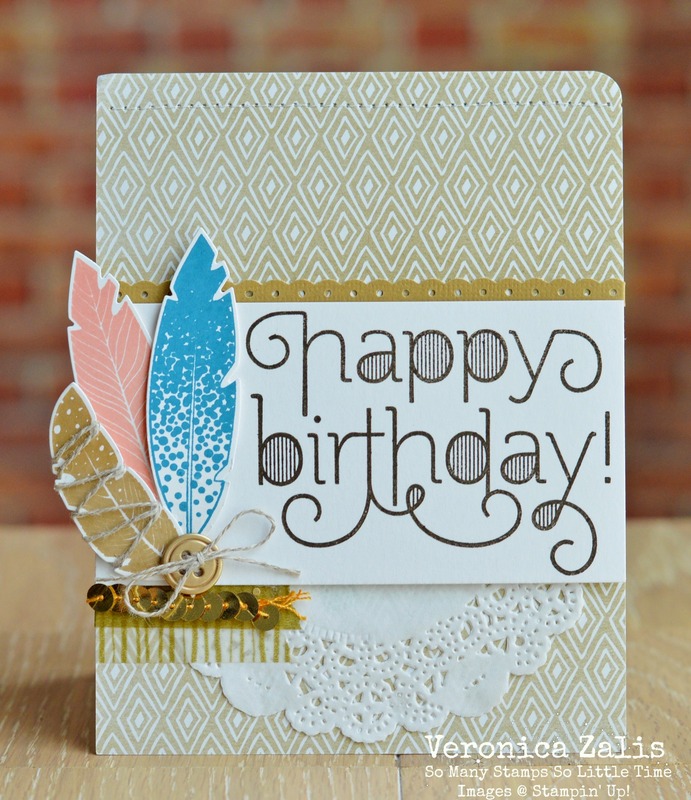 To create my card I used ONLY Stampin' Up! product. The beautiful Four Feathers stamp set, the Age Awareness photopolymer set, and DSP from the Color Me Autumn DSP pack from the Holiday catalog. I stamped the feathers using Brown Sugar, Crisp Cantaloupe, and Lost Lagoon. I added some of our gold washi, and gold sequins. I LOVED this card and I'm happy I was able to share it here with YOU! Thank YOU for visiting my blog today! Truly beautiful! I love the amazing execution--> ribbon sequins and doily elements! It really is too bad not to see this in publication. Thanks for sharing, Miss V.! Beautiful! So glad you shared this amazing almost was card! Veronica thank you for sharing what could have been, such romantic style. Thanks for sharing. gorgeous! I wish that issue printed...it would have been so fun to see the projects/inspiration! What a gorgeous card! Pity for the mag but thanks for sharing it! Awesome sentiment ... and those feathers are fantastic.